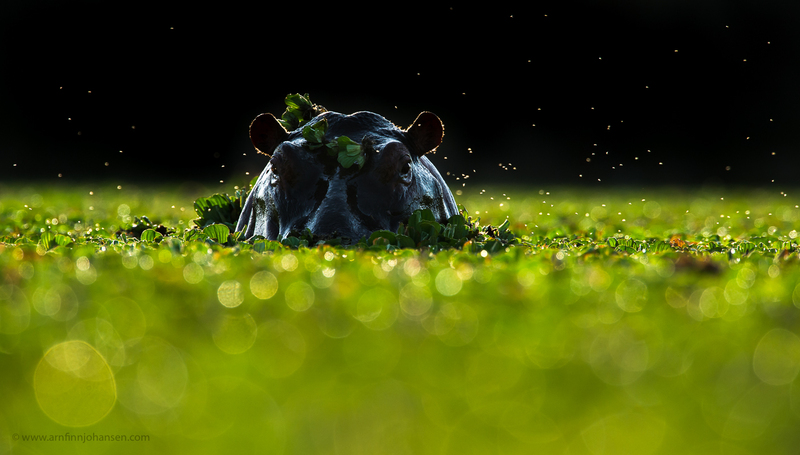 Selected from 9,000 images, it is a pleasure to let you know that my low angle backlight image of a hippo bull has been Highly Commended in the Mammals category in Asferico International Nature Photography Competition 2013. Asferico is among the four largest nature photography competitions in Europe, and is open for both amateur and professional photographers world wide. In 2013 totally 550 photographers and in all 9,000 images entered the competition. This year the winning ceremony will take place at the Asferico Photo Festival in Comacchio on the coast south of Venezia, Italy, at 4th – 5th of May 2013. The finalists and the highly commended images were all announced yesterday and can be seen in the Asferico Gallery 2013. The winning images will also be displayed in the Asferico 2013 Catalog availible for purchase from Asferico´s website. The small pond was completely covered with a green carpet of floating water hyacinths, and just as the hippo after a dive shows up from the water a swarm of insects took to the air. Laying on my elbows on the muddy shore with my camera gear and myself solid planted in an undefined mixture of water, soil and hippo poo, I had a great superlow angle from where to photograph this hippo bull in backlight in the early sunrise of Maasai Mara. Thanks to my good friend Big John, our Maasai guide guarding from the Landrover behind for other hippos coming back to the pool. Also thanks to Ole Jørgen Liodden and WildPhoto Travel for a great trip and company. Highly Commended photograph in Asferico International Nature Photography Competition 2013.
it is always a treat to watch your images and your low angle shots have inspired me in improving my photography as a armature. please don’t stop while at the top!